The fpop*fnum effect in the RANDOM statement creates a random intercept for each female animal. Because fpop and fnum are CLASS variables, the effect has 20 levels (10 rb and 10 ws females). Similarly, the mpop*mnum effect creates the random intercepts for the male animals. Because no TYPE= is specified in the RANDOM statement, the covariance structure defaults to TYPE=VC . The random effects and their levels are independent, and each effect has its own variance component. Because the conditional distribution of the data, conditioned on the random effects, is binary, no extra scale parameter ( ) is added. The "Model Information" table displays general information about the model being fit (Output 44.2.1). The response variable mating follows a binary distribution (conditional on the random effects). Hence, the mean of the data is an event probability, , and the logit of this probability is linearly related to the linear predictor of the model. The variance function is the default function that is implied by the distribution, . The variance matrix is not blocked, because the GLIMMIX procedure does not process the data by subjects (see the section Processing by Subjects for details). The estimation technique is the default method for GLMMs, residual pseudo-likelihood (METHOD= RSPL), and degrees of freedom for tests and confidence intervals are determined by the containment method. The "Class Level Information" table in Output 44.2.2 lists the levels of the variables listed in the CLASS statement, as well as the order of the levels. The "Response Profile Table," which is displayed for binary or multinomial data, lists the levels of the response variable and their order (Output 44.2.3). With binary data, the table also provides information about which level of the response variable defines the event. Because of the EVENT=’1’ response variable option in the MODEL statement, the probability being modeled is that of the higher-ordered value. There are two covariance parameters in this model, the variance of the fpop*fnum effect and the variance of the mpop*mnum effect (Output 44.2.4). Both parameters are modeled as G-side parameters. The nine columns in the matrix comprise the intercept, two columns each for the levels of the fpop and mpop effects, and four columns for their interaction. The matrix has 40 columns, one for each animal. Because the data are not processed by subjects, PROC GLIMMIX assumes the data consist of a single subject (a single block in ). The "Optimization Information" table displays basic information about the optimization (Output 44.2.5). The default technique for GLMMs is the quasi-Newton method. There are two parameters in the optimization, which correspond to the two variance components. The 17 fixed effects parameters are not part of the optimization. The initial optimization computes pseudo-data based on the response values in the data set rather than from estimates of a generalized linear model fit. The GLIMMIX procedure performs eight optimizations after the initial optimization (Output 44.2.6). That is, following the initial pseudo-data creation, the pseudo-data were updated eight more times and a total of nine linear mixed models were estimated. The "Covariance Parameter Estimates" table lists the estimates for the two variance components and their estimated standard errors (Output 44.2.7). The heterogeneity (in the logit of the mating probabilities) among the females is considerably larger than the heterogeneity among the males. The "Type III Tests of Fixed Effects" table indicates a significant interaction between the male and female populations (Output 44.2.8). A comparison in the logits of mating success in pairs with R females and W females depends on whether the male partner in the pair is the same species. The "fpop*mpop Least Squares Means" table shows this effect more clearly (Output 44.2.9). The PLOTS= DIFFPLOT option in the first LSMEANS statement requests a comparison plot that displays the result of all pairwise comparisons (Output 44.2.10). The SLICEDIFF =(mpop fpop) option requests differences of simple effects. The comparison plot in Output 44.2.10 is also known as a mean-mean scatter plot (Hsu, 1996). 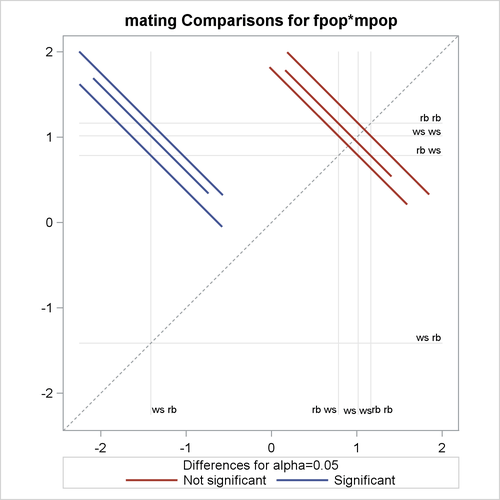 Each solid line in the plot corresponds to one of the possible unique pairwise comparisons. The line is centered at the intersection of two least squares means, and the length of the line segments corresponds to the width of a 95% confidence interval for the difference between the two least squares means. The length of the segment is adjusted for the rotation. If a line segment crosses the dashed 45-degree line, the comparison between the two factor levels is not significant; otherwise, it is significant. The horizontal and vertical axes of the plot are drawn in least squares means units, and the grid lines are placed at the values of the least squares means. The "Simple Effect Comparisons" tables show the results of the SLICEDIFF= option in the second LSMEANS statement (Output 44.2.11).